I just have to tell you that when I saw this Stampendous stamp at the store, I knew right away that I would have fun using it. Can you just imagine it as a background stamp - maybe tone on tone? Or embossed as a background? I chose to do a focal image for this card. First I stamped it on a piece of white cardstock and then again on some pink patterned paper. I cut around the patterned paper image very loosely and then adhered it over the cardstock one. I LOVE the way it turned out. I did add a little glitter to Ms. Butterfly because everyone looks better with glitter I think. Because this image was so pretty on its own, I didn't want to do too much else to the card. 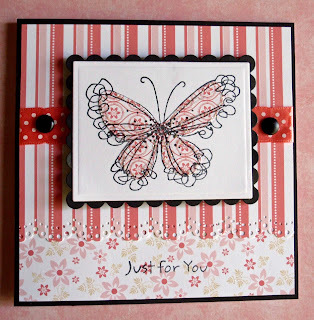 I just used a small rectangle die and its corresponding scalloped rectangle die (both from Spellbinders). The papers and the ribbons I used are all from PaperTrey Ink. The paper collection is called Text Style Pink Patterns. I have owned this paper for a while now - but they still offer it on the website. It is so cute all layered upon itself I think. Adding in the black accents just said COMPLETE to me. So I stopped. And I think I like it! 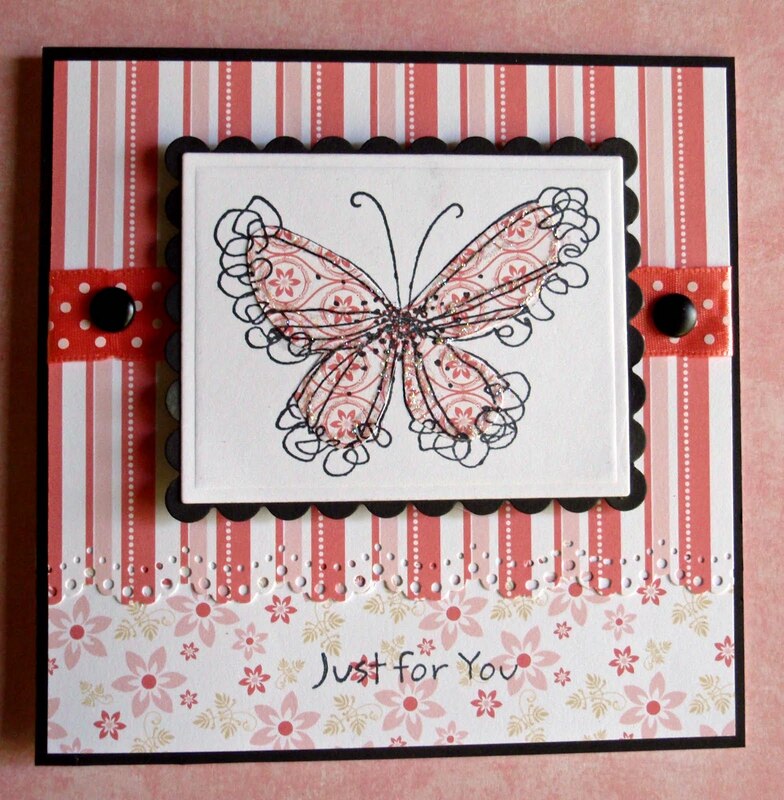 I'll see you back here tomorrow with another Stampendous creation.